The photos above are indications of what most people come to Ibiza looking for. During the “Clubbing Season” it grows from a population of a 180 thousand to 1.2 million people. Clubs with names like Cream, Cocoon, Privilege, Amnesia, and Space open up from at the end of May through the beginning of October. People from Europe, especially the UK, flock to party and soak up the sun on the beaches. AOL and other sites have reported on tourists’ shenanigans that take place there. However, since we were visiting in April, our experience was very different. We didn’t find too many sun worshipers on the beach in Ibiza Town. In fact, it was easy to get around and sometimes the city almost had a deserted feel to it. We were able to amble around Dalt Vila, Ibiza Old Town without fighting any crowds. The walls surrounding it date back to the 1500’s and it is a UNESCO World Heritage Site. Phoenicians, Carthaginians, Roman’s, and Moors each had a period of occupation on the Island. In 1715 King Philip V absorbed it into Spain. In more modern times it became a place of peace, love, and living off the land when Hippies descended on it in the 60’s. These days it has morphed into a tourist destination for those who like to party. I wonder if some of the offspring from the Hippies grew up and became club owners? Just speculating! Santa Maria Cathedral in Old Town is worth seeing and there are lots of interesting shops as well. But what I really enjoyed is the alter ego of Ibiza; the raw unspoiled beauty of the island is in complete juxtaposition with the glamorous material lifestyle of clubbing. Allison is an avid hiker, and she guided us to some breathtaking views. The huge rock in the lower right of the photo collage above is Es Vedra. Reported to be one of the most magnetic places on earth, some say below it lays the lost city of Atlantis. Further highlighting the Island’s dual personalities was our experience of eating at two very different restaurants that basically had the same menu. The first one, extremely expensive Es Nautic in San Antonio, was suggested by the mother of the girl Allison au paired. It was located next to the harbor in which the family kept their sailboat. Typical to what Allison had relayed to us about the mom’s behavior, she packed her daughter in the car with us, and sent us on to the restaurant even though it wasn’t a scheduled babysitting time. Of course, she did not send the little one with any money, so we footed her portion of the bill. We rationalized that observing the girl’s behavior was worth it as she plowed through eating more than her share of the family style servings. Es Nautic had a beautifully appointed dining room. The table setting was lovely and the presentation of the food was fabulous. The second restaurant, El Bigote in Cala Mastella, was quite a different venue. It is shown in the photo above. This outside eatery with the most remarkable view has two servings everyday and all patrons are served the same dishes cooked right in plain sight on an open fire. The girl was with us for this meal also; this time she ate a bit more modestly. Apparently she suffered some stomach problems after the first experience! We ordered just about the exact same tradition Ibicenco dishes from both restaurants. The food photos were taken by me but the photos of the recipes are all from www.Ibiza.Travel . Both restaurants brought bread, olives and aioli to the table. The bread alone was very bland, but it was fantastic with aioli spread on it! The olives were the perfect complement to that bread combo. On the left above is Es Nautic’s rendition of the fish stew, Bullit de Peix. 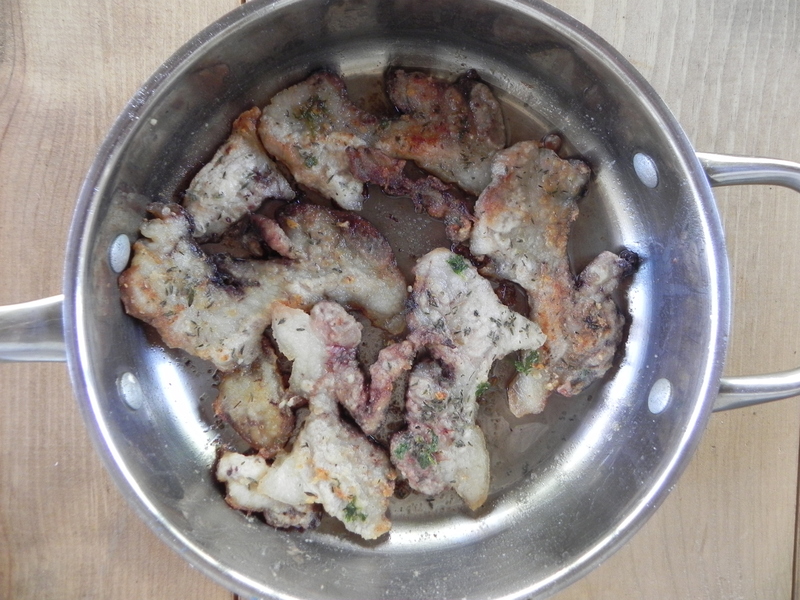 On the right above is El Bigote’s version and right below shows how it was cooked. The dish gets its orange hue from saffron. Delicious rice served after diners eat this main dish and is prepared in the cooking broth left behind from the fish. Notice how Es Nautic’s is served with aioli poured over it. In both restaurants the fish still had tails, tentacles, and all still attached! The dessert above is Greixonera from Es Nautic. It was pretty good, but not as good as Allison’s favorite Ibizan sweet, Flao. Flao is a goat cheese tart laced with mint; the recipe for it is in the Spanish coffee post mentioned above. So which restaurant did we like better? It’s hard to say! Both are very authentic to Ibiza; one reflects the pampered life and one showcases the natural beauty of that part of the world. The fact is – I would go back to either one of them in a heartbeat! On the left above, is one of the several cups of coffee I had the first day I was in Spain; the photo on the right was taken just before heading to the airport to return home. Just about a year ago, we had a great time visiting Allison in Spain. She was employed by a program that places native English speakers as teachers in secondary schools. During her week of spring vacation, Roy, Jennifer, and I met her in Madrid. We spent a couple days there, drove a rental car to Portugal, and then returned to Spain where we explored Seville, Barcelona, and finally Ibiza. A few weeks ago I woke up to the fact that I hadn’t done much sharing of our trip, so I blogged about Mannequins, Markets, and Tortilla Espanola. Here is my documentation of how I fell in love with Cafe con Leche and some of the delicious things I ate while sipping it. Roy and I flew into Madrid within minutes of when Allison landed there from Ibiza. We had agreed on where to meet ahead of time by using the map on the airport website. I was excited to see her, but also so impressed at her ability to figure out the subway system and guide us to our Airbnb apartment. After dropping off our suitcases, we explored our neighborhood and discovered a little cafe just down the street. It was there that I had my very first Spanish breakfast and cup of coffee. I followed Allison’s lead and ordered Pan Con Tomate ( bread with tomato) and a side of jamon iberico (Spain’s famous ham) just for the fun of it. Basically a DIY deal, it was up to me to slather the grated tomato onto toasted bread which had been rubbed with a little garlic. Then I sprinkled it with coarse salt and drizzled it with olive oil. If that wasn’t delicious enough, I added some of the ham on top and thought it was about the best breakfast I ever had. The cafe con leche was just the thing I needed for my jet lag. It’s made by pouring a shot of espresso into a cup and then filling the rest of it up with warm milk. The designs seen on top are achieved by pouring the milk in second with an experienced steady hand and using a toothpick to coax it into shapes such as hearts. I found coffee made this way so yummy, that I wanted to stop and have a cup of it every chance we got. Slice and toast pieces of baguette. Lightly run the garlic clove over the top. Grate the tomato into a bowl, discarding the skin. Slather the tomato pulp on the toast. Drizzle with olive oil and sprinkle with coarse salt. Nice additions are the Spanish ham or sausage and manchengo cheese; either can be found in a specialty store or Whole Foods. The next day Jennifer joined us and it was her turn to deal with jet lag. A friend of Allison’s had told her about a bar in one of the Madrid neighborhoods that had great food. We took the subway over to it and found it was just a “hole in the wall”, but the food really was delicious. We munched on crusty bread, triangles of manchego cheese, and an impossibly tender meat dish that must have cooked in its perfectly spiced sauce for several hours. 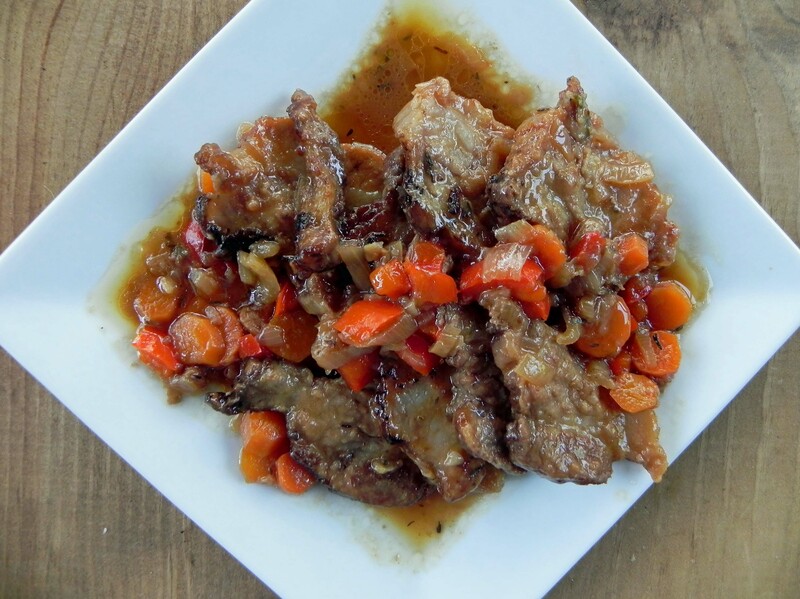 I attempted a similar dish in a post written soon after we returned, Tapas Inspired Braised Meat in Port Wine Sauce . While we were eating lunch, Jennifer ordered a coffee. It was delivered to her as a shot of espresso in a glass. I was surprised, but found out later that serving coffee that way was not uncommon. At the tail end of our trip, we ended up in Ibiza. It’s a legendary place for Europe’s rich and famous to frolic, but Allison worked their during the off season and never was fully exposed to how riotous it is reported to be! It seemed pretty tame while we were there, but there was no denying how absolutely breathtaking the raw beauty of the island was. For a sample of Ibiza photos, visit this post on Allison’s entertaining blog Naptime with Yasmine. One afternoon after wandering about, we stopped to watch the sunset and grabbed (of course!) a cup of coffee. We also ordered a slice of Allison’s favorite dessert, Flao. It is sort of like a cheese cake in a pie crust. The version Allison liked best was made from goat cheese and flecked with minced spearmint. Click here for a recipe I found on the web . 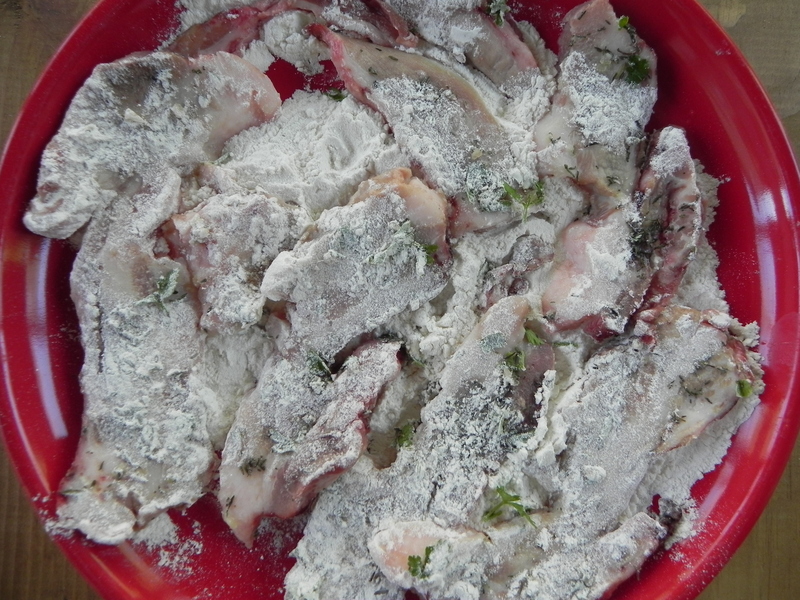 I’m also going to post a photo of recipe I downloaded from http://www.Ibiza.Travel because I think it might be more authentic to what we sampled. Full disclosure: I have not tried making this yet, but hope to make it for Allison some day! Now, a year after our trip, I still drink my coffee with half a cup of warm milk in it. The other half is rarely actual espresso; the majority of the time it’s just regular American coffee. Thank goodness for microwaves – right? I’d love to hear about anyone else’s coffee traveling experiences – please feel free to comment! Ever feel like life is a roller coaster and every time is starts to slow down, it takes off again? In my case, perhaps a speeding train would be more like it. For the last year or so, I just seem to be headed to one experience after another. Throughout it all, I have enjoyed taking photos, but I haven’t taken the time to pause and do anything with them. Currently, my husband and I are living the dream (O.K. – maybe his dream!) of traveling around the United States in a motor home. Check out our travel blog at Yates RV Adventures. A couple of weeks ago, we were staying at a RV “resort” in Naples, Florida. These parks typically are a mix of prefab homes and recreational vehicles. As I was passing one of the homes, I was startled to see a mannequin guarding the door. My memory was jolted back to another mannequin I had seen when we were in Spain visiting my daughter Allison just several months ago. All of a sudden I realized I had tons of photos and lots of experiences from that trip that I had never shared or done anything with because the train I was on never slowed down. The Spanish mannequin I remembered was looking out onto the Mercado de San Miguel in Madrid. It was the first of the many fabulous markets we encountered on that trip. It had booth after booth of beautiful produce, meat, and seafood. Best of all, it had delicious ready made food that could be eaten right there or taken away for a meal at home. One dish every market in Spain had was Tortilla Espanola. This Spanish tortilla is basically a very yummy potato torte and is a common every day food in Spain. A wedge of it could be an entre, or cut in squares and served with aioli, it is often part of a tapas spread. The lady of the house where Allison was staying made it for us one night for supper and I saw how simple and easy it was to make. In this post are photos of some markets we saw on our travels. Below them is a recipe for Tortilla Espanola. The classy senorita on the left overlooks the Mercado de San Miguel. The American mannequin on the right surveys the trailer park. Above is the beautiful Mercado de San Miguel, a wonderful market in San Miguel Plaza in Madrid. This is a shot of my daughter Jennifer walking into a market in Porto, Portugal. Whether they were big or small, these places of commerce offered fresh meat and produce and we thought they were all charming. The Mercado de Ribeira in Lisbon, Portugal had the largest food court we had ever seen. The market area was in one side of the building, and the Time Out Food Hall was in the other half. Beautiful greens in the famous La Boqueria on La Rambla in Barcelona. The Mercat Nou in Ibiza, Spain sold every thing from tea and liquor made from local herbs to their famous salt and honey. Of course the market in Ibiza had an offering of take away foods, including a Spanish Tortilla. In a skillet, saute the onion in 2 tablespoons olive oil until tender. 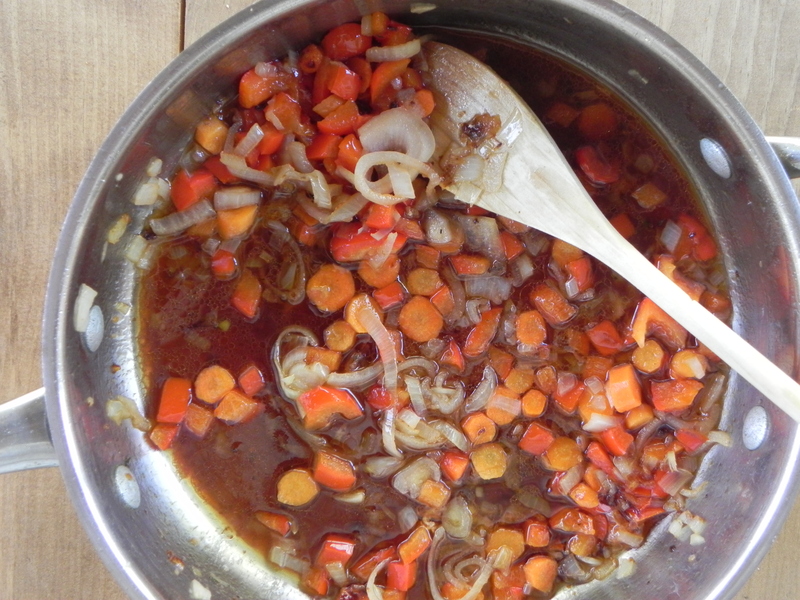 Remove with a slotted spoon and set the onions aside in a mixing bowl. Add 1/4 of olive oil and the sliced potatoes to the pan. Cook, covered, over fairly low heat for 20 to 25 minutes – gently turning over once at 10 minutes. Potatoes will be done when they are easily pierced with a fork but still retain their shape. Carefully remove the potatoes from the pan with a slotted spoon and add to the onions in the bowl. Discard all but 2 tablespoons of oil from the pan. Whisk the eggs, salt, paprika, pepper, and saffron together. Pour the egg mixture over the potatoes and onions. Gently mix the to coat the potatoes and onions. Add the potato mixture to the pan and cook over low heat. As the tortilla slowly sets up, run a rubber spatula along the sides to create a rounded edge. When the tortilla is almost completely firm, remove the pan from the heat. Place a plate on top of the skillet and using pot holders or a kitchen towel to prevent being burned, flip the pan over so that the tortilla is on the plate. Then slide the tortilla off the plate and onto the skillet. Place back on low heat and cook another 3 to 5 minutes. Invert onto a serving plate and either cut into slices as a main dish or small squares as part of a tapas spread. Whisk together mayonnaise, lemon juice, garlic, paprika, and saffron. I’d love to hear anyone else’s experiences with the markets in Spain or Portugal! Seville, Spain is full of wonderful little tapas restaurants that seem ageless. 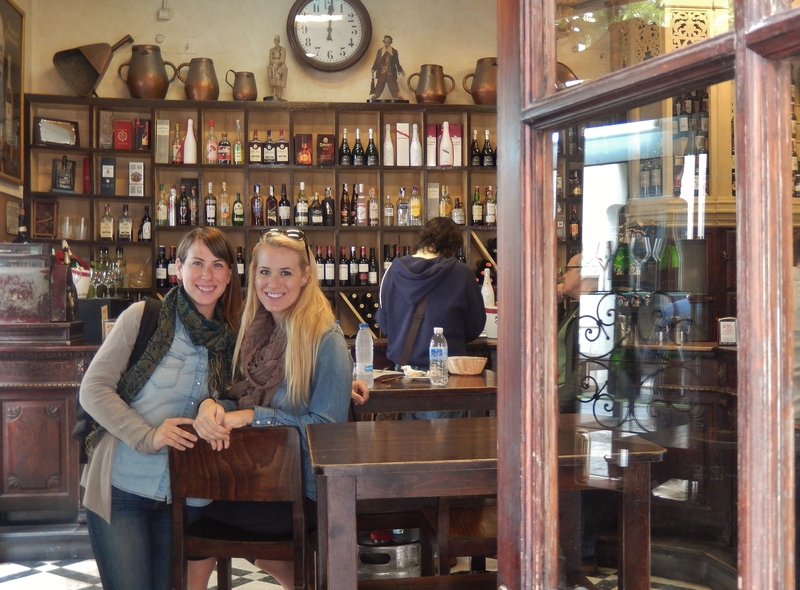 Recently, we took a vacation to Spain & Portugal and met up with Allison and Jenn. We had a wonderful time and covered a lot of ground; we visited six cities in two weeks with stops along the way. We loved the architecture, the scenery, the museums, but especially the amazing food! Each city has a unique feel to it which is reflected in its many cafes and tapas bars. We enjoyed making a meal by wandering into interesting looking places and sharing two or three small plate offerings. Especially delicious were the small portions of meat that were obviously slow cooked and surrounded by a fabulous sauce. 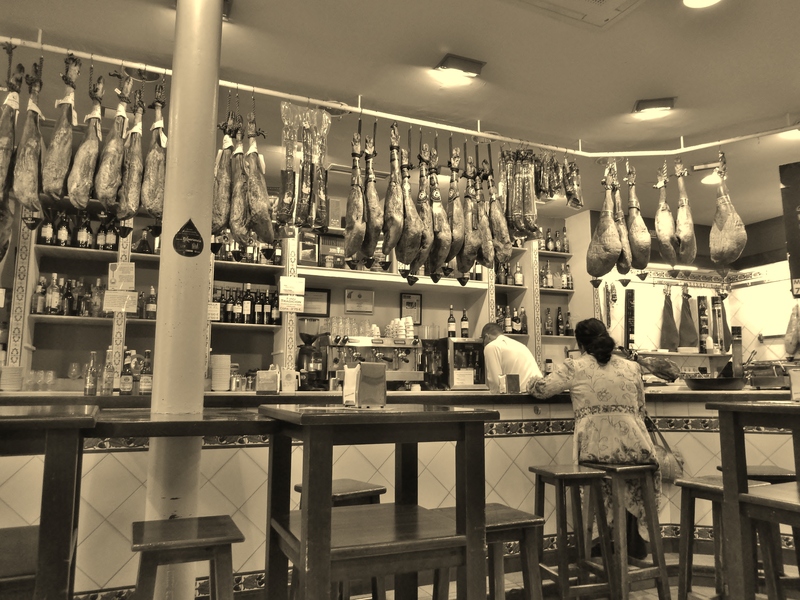 In Spain and Portugal, pork is everywhere (but there is also beef on the menu as well). I was impressed with how every bit of the pig was used such as the cheeks or the tail. 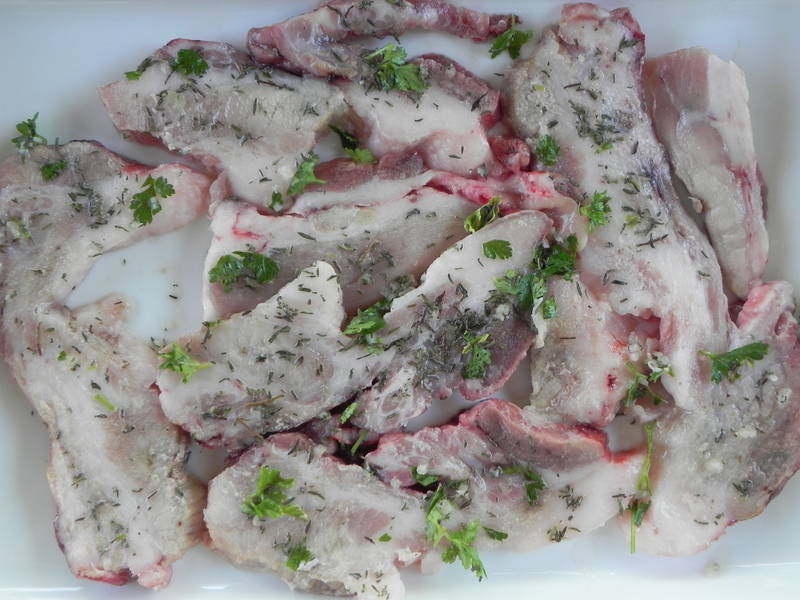 Our family purchased a quarter of an “organic” hog a while back and I had a package of jowls which I used for this recipe – along with a pork chop. 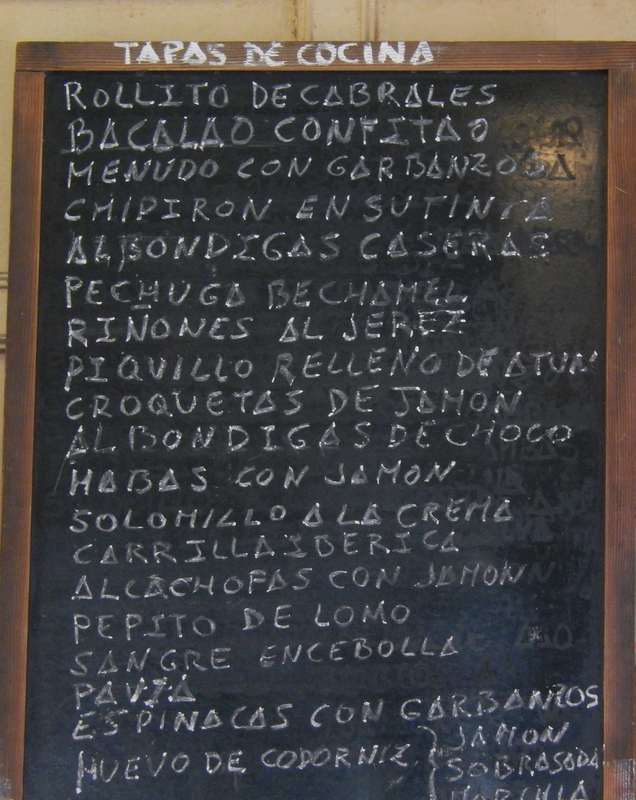 I have to credit this blogpost on the site Spanish Sabores for giving me inspiration. 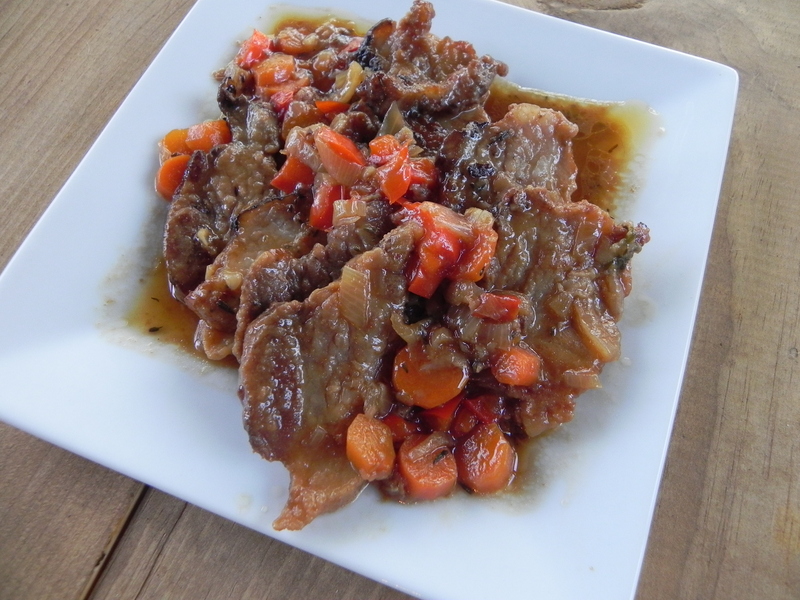 However, the dish posted here could also be made with a lean cut of beef. 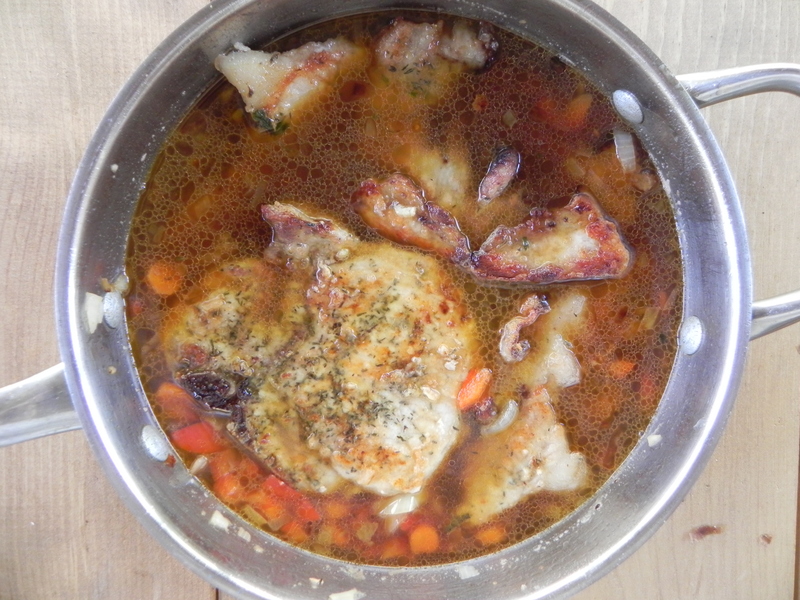 Serve with slices of crusty bread to mop up the sauce! 1. 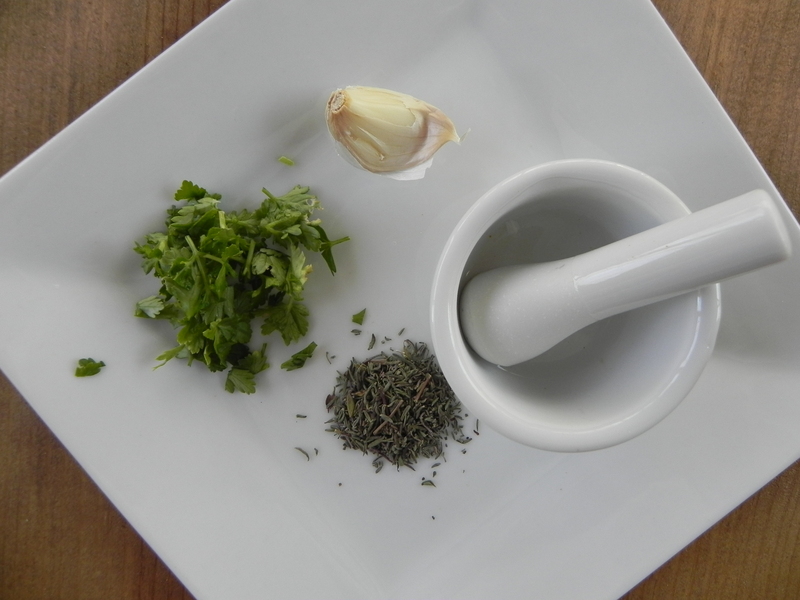 Make a paste with the garlic, parsley, thyme, and water. 2. Rub the paste into the meat and allow to sit for 20 minutes. 3. Lightly dredge both sides of the meat with the flour. 4. Put 2 tablespoons of olive oil in a skillet, and over medium heat, brown both sides of the meat. 5. Remove the meat from the skillet and set aside. 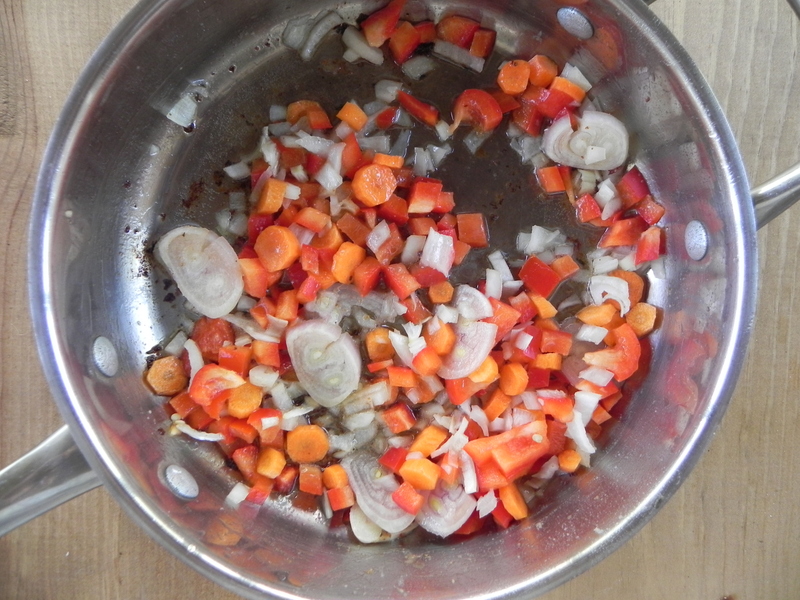 Add the carrots, red bell pepper, onions, and shallots. If necessary add another tablespoon of olive oil and saute the vegetables over medium heat until tender – about 5 to 7 minutes. 6. Add the Port wine, bring up to a boil and scrape up any crusty bits from the bottom of the pan. 7. Place the meat back in the skillet, pour in the beef broth, cover the pan, and simmer over low heat for about 1 1/2 hours or until the meat is very tender.